Computertime is parental-control software that lets parents set limits on the amount of time and the time-of-day when their children can use the computer and internet. Softwaretime believes that the computer is an amazing tool for children, both for educational and social purposes. However, children need to have reasonable limits set for them, and that s what computertime allows you to do, quickly and easily. You no longer have to keep track of the time your children spend on the computer. Computertime does that for you. It takes just a few minutes to set limits for each child. Computertime will give you the control you need, and give you back your sanity. 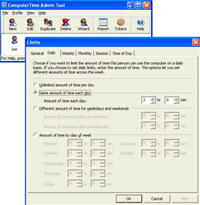 ComputerTime is an utility that works under windows xp, windows vista and windows 7. It supports both 32-bit & 64-bit windows editions, therefore it could run faster on 64-bit computers. Estimated download time for ComputerTime on a common adsl connection is less than a minute. Version 4.2.0 was released one thousand four hundred seventy days ago by SoftwareTime. Click the green download button to download it now.